As the game begins we see Mickey and Minnie frolicking through a meadow on a bright and sunny day in Disney land. All of a sudden, the jealous and evil witch Mizrabel appears and snatches Minnie away while Mickey stands there frozen, seemingly too shocked to do anything about it. Only after the scene ends does he come to his senses and decides to go save her from Mizrabels hiding place... The Castle of Illusion! *dramatic overture and cracks of lightning* Well folks, this is a platformer from 1990 and so it can get away with such a generic excuse for a storyline as long as it delivers in other areas. Castle of Illusion is a typical platformer with all the usual ingredients of a game in this genre. You go from level to level, jumping on or throwing blocks at enemies, avoiding obstacles and collecting power ups in the form of gold coins, extra lives and cakes that replenish your health, and there are secret rooms scattered throughout the game in which you can find special stars that increase your health bar. Being a Disney game, it is geared towards a younger audience and so it shouldn't be too much of a hassle to get through. It even features a practice mode of the first three levels for the really little ones. One interesting feature of the game is the inclusion of locked doors for which a key has to be found. 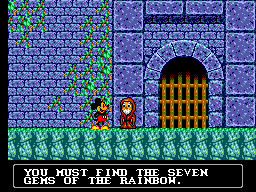 This adds a light exploration element to the game that was further developed later on for the sequel, Land of Illusion. All in all the game consists of only 6 stages and 7 bosses, so it's a somewhat short romp for a platformer of the time. 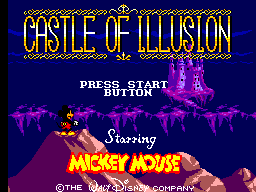 Castle of Illusion looks good, so good that if a Mega Drive version didn't exist people might even mistake it for a 16-bit game just looking at the screenshots. All the sprites are well detailed and have a classic Disney feel to them with cartoony and expressive faces and animations. Each level has a certain theme to it and most of them differ from the 16-bit game. For example there's the classic Disney locals like a forest and a clockwork tower level, and also levels with an obvious kiddy theme like the level made entirely out of candy and a chocolate bar boss, a school bench level in which you fight living letters among giant books, pencils and rulers. While the compositions themselves are memorable and quite catchy in places, they sound tinny and without depth. Add to this that most of them are extremely happy and upbeat tunes and you can see how they can get on your nerves at times. Sound-wise there are fitting effects for just about everything and they add a lot to the Disney feel of the game. Fairly simple and overall very responsive. Button 2 is for jumping, button 1 is for attacking and picking up objects. The movement controls are quite good but somewhat floaty making some of the harder platforming segments harder than they should be, and having to push 2 buttons to perform a jump attack on the enemies takes is unnecessarily complicated when they could've just let you double tap the jump button. The most problematic aspect of the controls shows itself when picking up objects. 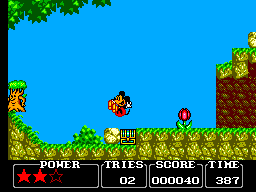 You have to press towards the block until Mickey gets in position and there is a slight delay before you can actually pick it up, which is also slow compared to his other actions. This wouldn't be much of a problem if there weren't parts of the game where you have to pick up and throw objects at a quick pace so as not to not get hurt by enemies on conveyor belts or crushed by walls. There's not much to the game in terms of replay value. There's only the normal mode and the practice mode mentioned above (which you probably won't play if you're old enough to read this review), and the game is fairly short and easy. As already mentioned it's a game geared towards a younger audience. On the plus side there's the option to choose the order in which you go through the initial three levels, and you can challenge yourself by not picking up any of the stars that increase your health by one. The overall quality of the game is enough to have you coming back for more, but probably not more frequently than once a year or so. If you're looking for a light-hearted pick up and play game that is not too lengthy or challenging but with otherwise high production values then pick this game up. If you're a fan of Disney games in general, this is another good game to add to the collection. It's one of the better games for the system, it's easy to find and fairly inexpensive.